As promised, we did see the impressive redwood trees. Our plane landed in San Francisco, we bustled over to IN-N-OUT for lunch, which was a crowd pleaser and only a short drive from the reserved shuttle parking for Muir Woods. RESERVE a spot for the shuttle or parking. The trees were amazing and the walk easy and short enough that our boys didn’t complain about tired legs. We drove across the Golden Gate Bridge. Mostly Adam was excited about this. 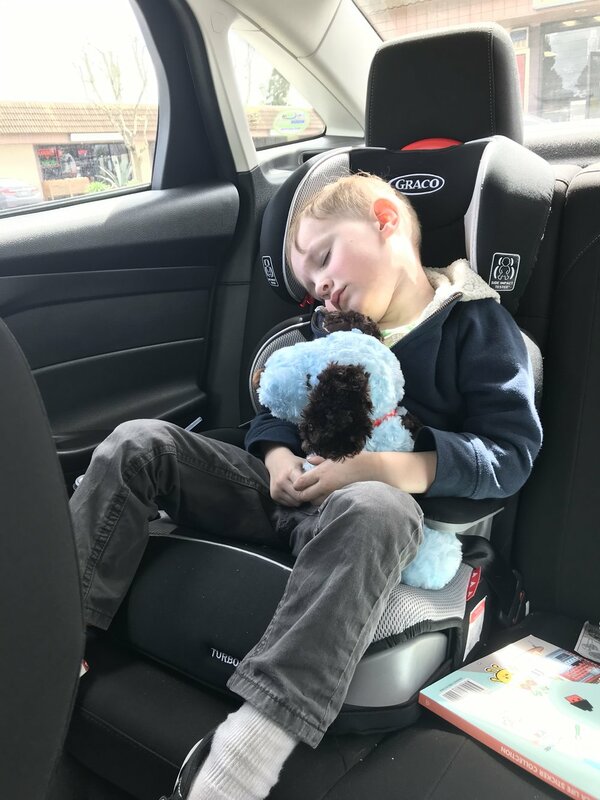 Wiley, our 4-year-old, napped in the back and Logan, our 9-year-old, had his head stuck in a book. We had dinner at family-friendly Boxcar Chicken and Biscuits in Sonoma. The views here were beautiful and the boys enjoyed that there was open space for them to play while we waited on our food. Logan has dreamed of going to Bouchon Bakery ever since his dad brought him home an Oh Oh after a previous visit years ago. So the decision on where to dine for breakfast was easy. Logan had his Oh Oh and my youngest had two mini brownies. Vacation. It’s here that we parted ways with Adam, who needed to get to work. I took the boys to Sonoma Train Town, where they rode some kiddie rides, took a mini train ride to a petting zoo, and had loads of fun. We spent about two-and-a-half hours there before driving back to our hotel in Napa to meet up with Adam and his business partner. All of us drove out to one of the few recommended wineries to visit with kids: Sterling. The kids really did enjoy the aerial tram ride! We hadn’t had lunch and there wasn’t much in the way of food here but we did enjoy the artisanal cheese and charcuterie platters. Our kind waitress brought a wine glass full of extra breadsticks for the boys. They also had a juice box and Cheez-its which were included in the goodie bag they received with their tram ride ticket purchase. 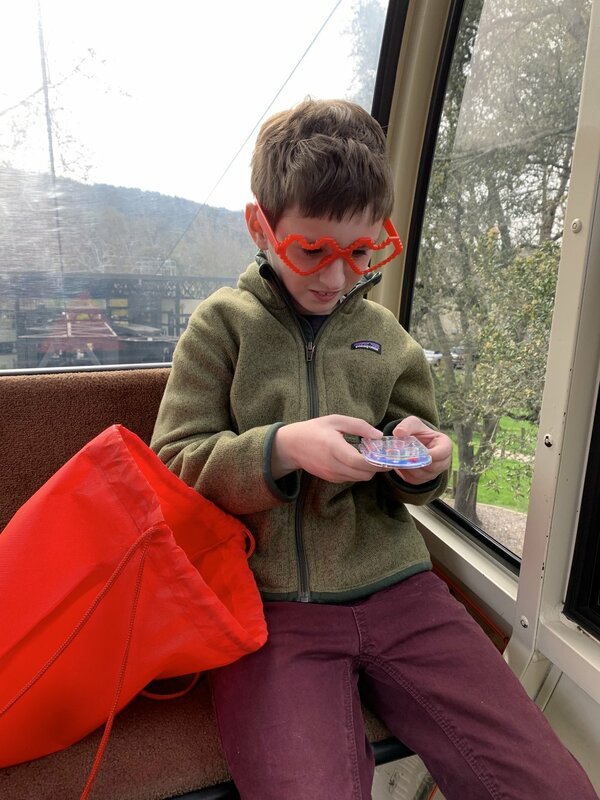 I had really wanted to take the kids to a family art workshop at di Rosa Center for Contemporary Art, but I tried to book this only a week in advance and it was already full. The workshops look awesome though, so check those out earlier in your trip planning. It was a bit rainy so we opted to do a little shopping in the morning. We all thoroughly enjoyed Copperfields Bookstore in Petaluma and spent a good 2 hours here browsing before making our purchase and heading to lunch at IN-N-OUT again. Boys request. They wanted to share a chocolate shake but, do take note that IN-N-OUT serves free hot chocolate to kids on rainy days! For dinner, we drove a bit to a pizza place called Rosso in Santa Rosa. (The Petaluma location had closed down but this was on my list of kid-friendly dining options. Did I mention that my youngest can be a monster in restaurants? So off we went even though it was out of the way.) The kids got to play with raw pizza dough until we were served our food and, for that, I was extraordinarily grateful. Well, I hadn’t checked museum hours and discovered that what I had planned to do was no longer an option. 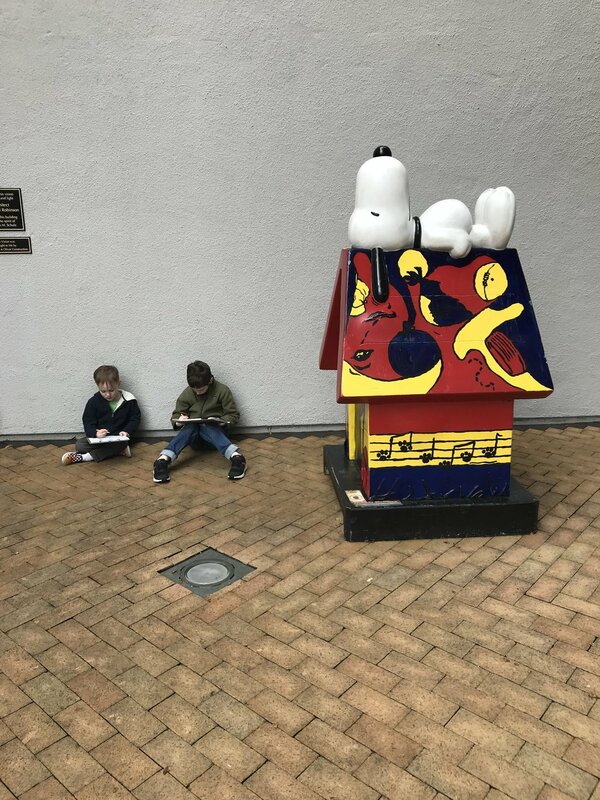 Both the Charles Schulz and Children’s Museum of Sonoma are closed Tuesdays during the time of year we went. Oof. No matter. We drove to Sebastapool and had a pleasant walk up and down the street to view the junk art of Patrick Amiot. We then enjoyed a local playground before walking over to Screamin’ Mimi’s for a little lunchtime ice cream. Logan had a mixed cookie, Wiley a blueberry, and I had lemon and rosemary. It was SO GOOD! The boys had reservations at Cloverleaf Ranch for horseback riding lessons so we headed out to Santa Rosa. I had previously made the reservations with Dawn, who was able to accommodate my request to increase my youngest son’s session by 30 minutes so that both boys would be occupied for the same amount of time (they typically only do 30 min lead line lessons for 4-year-olds). These ladies — Dawn and Brianna — were phenomenal instructors. Dawn didn’t have another lesson booked and spent a little extra time with the boys after the lesson finished. She introduced them to her 3-week-old baby goats and 2 hogs. I highly recommend lessons here. I’m pretty sure my 4-year-old was grinning widely the entire time we were there. We made our last trip to Bouchon Bakery today. It was another rainy morning so we didn’t have to wait long! There is only outdoor seating at Bouchon so we ate in the car as the windows fogged up. Then we drove to the Charles Schulz museum. It’s a lot of comic strips on the wall which Logan loved. Luckily, there is an interactive scavenger hunt so that helped to keep Wiley engaged. There is also an educational room where kids can tap into their creativity with coloring sheets, blank comic strips, and zoetropes readily available. Adam was finishing up about this time, so we headed back to downtown Napa, enjoyed another local playground and then all went to dinner at Rutherford Grill before calling it a night. The boys and I were able to enjoy Napa Valley sans wineries (with the exception of the family-friendly Sterling). We hope this helps if you’re bringing kids to Northern California.